This challenge inspired us to coordinate our very first “Day of Giving”—a full day of volunteer work with a partnering nonprofit. 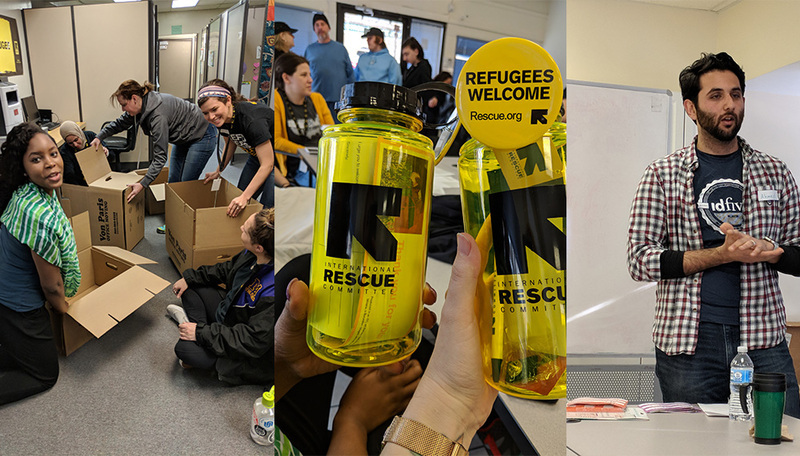 After much planning and preparation, we held our inaugural “Day of Giving” on a Saturday in March, when we helped clean, pack up office supplies, and drop off deliveries for the International Rescue Committee (IRC)—a global nonprofit that provides opportunities for refugees, asylees, and other immigrants. The day turned out to be an extremely rewarding (and fun!) experience that taught the idfive team a ton about volunteerism and the nonprofit world. As a mission-based company, volunteerism reinforces our company values and helps us attract and retain talented, good-hearted people. If your organization is aiming to execute a similar cause-based event, these takeaways should help you pull off a successful and rewarding day, too. It was important for us to make the “Day of Giving” a true group effort. Not only did we want everyone to get excited about the event, but we also saw this as an opportunity to search our own personal and professional networks for a contact at a local nonprofit. First, we challenged our team to search for a nonprofit that they would be excited to partner with. With the whole company in attendance, we then held a “Day of Pitches” in which employees advocated for their nonprofit—and finally, we all voted on our favorites. 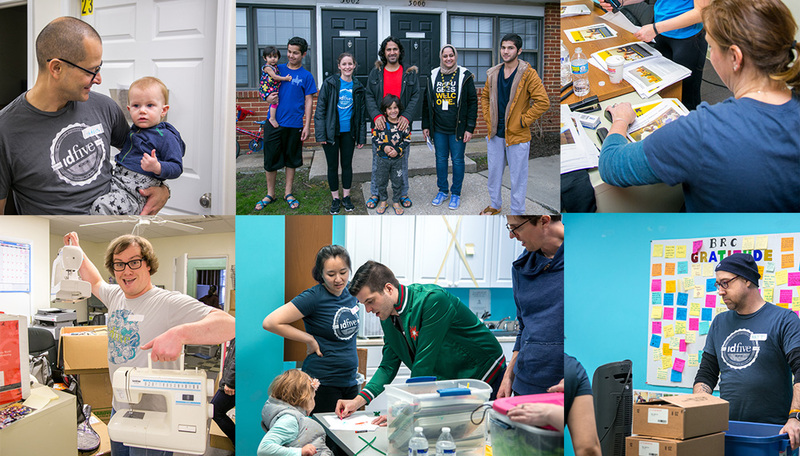 Through this process, one employee discovered that the International Rescue Committee in Baltimore was about to relocate their offices, and by helping them pack, clean, and deliver items to their clients we could save the organization critical funds for the coming year. Relying on our own networks made the effort much more enjoyable and impactful for idfive and the IRC. It allowed us to partner directly with the organization and plan the logistics, and the pitching and voting process generated a sense of excitement and commitment. After arriving at the IRC office just before 9:00 AM, the organization thanked us for coming and gave an overview of their mission. We heard from a number of their division leaders and were able to get a better understanding of their work, as well as get to know the people we were helping. Midway through the day, the IRC brought in a client who had recently come to the United States from Syria. He discussed his life in Syria, his hopes and aspirations for his family in the United States, and how the IRC helped him find employment, a physician for his family, and schooling for his children. Learning about the IRC and their mission was a critical part of the day. Not only did we walk away with a greater understanding of the organization and its goals, but what we learned inspired us work to even harder. That positivity spread quickly and it made a lasting impression for both idfive and the IRC. If you carry out a “Day of Giving” of your own, make sure to bond with the organization as best as possible! The most important thing about volunteering is to be enthusiastic and positive. Not only does it make the work more rewarding and the experience more enjoyable, it also shows the organization how much you care about their mission. Nonprofit organizations everywhere face impossible challenges daily. Their work is demanding, and advancing their missions often feels like an uphill battle. But by supporting their efforts—whether through donations, volunteerism, or advocacy support—we can encourage them to persevere. As a global nonprofit that serves refugees, asylees, and immigrants, the IRC has had a challenging year. Yet amid all the political and economic turmoil, they continue to do amazing work every day. Being able to help the IRC during this tough time was incredibly satisfying, and the organization’s director told us how motivating it was to have us bring our hard work and energy into their office. At the end of the day, the IRC even offered to help us out when we move offices—which demonstrates the best part about giving: It inspires more giving.